I'm pretty sure that when God created a cowboy's wife, He had LeAnn Hart in mind. She's tough, compassionate, kind and courageous. This pretty lady stands by her husband and will step into help in whatever situation that he needs her in. She's also an amazing mother and friend. And talk about TALENTED! 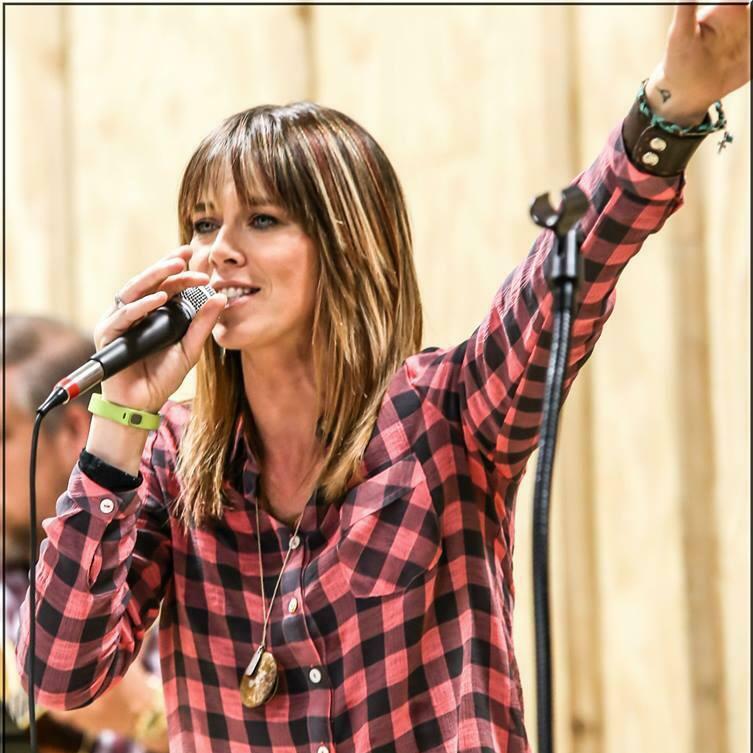 She can sing, write songs, play the guitar and preach about Jesus better than most ministers! Miss LeAnn posts beautiful video devotionals on Facebook and her words are always so simple and applicable in this crazy world that we live in. I'm so blessed to call her my friend and I really look up to her as a sister in Christ, a wife, and especially as a mother. Her and her husband, J.W., live in Marietta, Oklahoma with her two sweet kiddos, Makayla and Wacey. Every time I get to see I'm so captured by her zeal for Jesus and her love of others. I'm so excited to share this interview with all of our readers here on Cooped Up Cowboy's Wife. Cooped Up Cowboy's Wife: Can you share with us your testimony? A little bit about how you started living "all out" for Jesus? LeAnn: I was 8 yrs old when I said, “Yes” to Jesus. It was the week of Vacation Bible School and for the first time my ears were open because I had never before heard our pastor speak of Death, Hell and Heaven like he did that day. We had an old dairy barn that had been mangled from a tornado and I found myself climbing to the top thinking about what the pastor had said. I don’t know if I even waited for the invitation prayer to end that next day before I was running to the front. This girl did not wanna spend eternity burning! Even though I had made a commitment pretty early I didn’t understand the relationship part, that came later. Years ago, JW and I were going through a string of messes in our marriage. After a few months, I found myself give out, crying and begging God to fix everything on my bathroom floor. In those next few moments I heard a voice whisper, “If you would stop looking down and start looking up, you can get past this pain.” The next morning I woke up and what I couldn’t fix, God did and He still is today. Cooped Up Cowboy's Wife: What was your upbringing like and who were the people that helped shape who you are today? LeAnn: From the time I came out of my Momma’s womb I was raised in a Southern Baptist Church. My Dad’s family would visit different churches doing Special music. I remember a story Dad would tell about a family of Gospel singers called the “Happy Goodman’s” and how they wrote a song called “Who Am I” at my Grandparents house. Dad said, “Momma made me go to bed, but I sat right by the door and listened while they wrote that song!” I always thought that was pretty neat. If you were to visit my Dad’s parents house you would leave there with a Joy that couldn’t be explained! I don’t know if there was anyone who ever went there that didn’t hear something good about Jesus. They have moved on to greener pastures now, but are still a huge influence in my walk with Jesus today. My Dad was also a huge influence! When my parents were starting to fight and eventually decided to get divorced, my Dad was a constant voice when it came to speaking life over what seemed like the darkest time of my life. I have letter after letter from him and no matter the circumstance, God never changed. I am forever thankful that he took time to remind me of that. So I never lost touch of the Gospel no matter how far I strayed because of the time others invested in me to never back down from sharing a story that would outlast the temporary messes that this life seemed to bring. Cooped Up Cowboy's Wife: You have so many irons in the fire, can you share with us everything you're involved in and how you get it all done successfully? LeAnn: I am a Ranchers Wife by choice, a Momma by grace, a Foster Parent when I can be, a Worship leader every Sunday & Wednesday not because of a dream but because of a prayer, we host a Lifegroup of 35 plus every Monday in our home all because Jesus made a way, the Chair Woman for our local Toy Drive and Angel Tree, Photography is my trade as well as my joy and Ministry is my heart… I have always been busy but before marriage and babies I was alone in my busy. Having a family when your busy it's important to not let the stew sit for too long without stirring the pot. Otherwise the good stuff will start to stick to the bottom! I keep that in mind with all things… I choose what I get involved in by praying first and if its something that is just “good” then I say, “no” but if I know its the “best” then I say, “Yes.” For the first few years, I got lazy in paying attention to how much I was gone and how that affected my family. I started to ask the Lord to remove people and things from my life that weren’t helping me grow in my walk. If what I was involved in wasn’t growing the Kingdom of Heaven I didn’t need to be a part of it. Little by little, people started to step out of my life and before I knew it God had planted a beautiful garden of people around me that were desiring to grow just like me. It's also important to listen to your family when they speak! If JW mentions, "I need clothes washed" then I ask God to help me make time. If Wacey says, “Momma are you gonna watch me ride my calves.” Then whatever I am doing can wait and I go watch Him. If Mac says, “I need help with my homework.” Then it's time for me to sit at the table and help. It's important to include your family in your projects! It's important to have that ME time as well, but when you learn how to get connected together, you learn how to stay together… The key to my success is I keep Jesus in the middle of my everything! 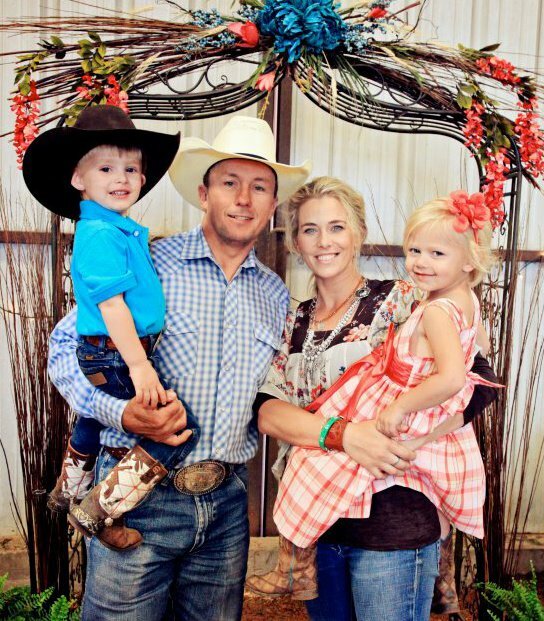 Cooped Up Cowboy's Wife: What are the "tools of success" that help your marriage? Cooped Up Cowboy's Wife: Do you mind sharing how you two came to the decision to adopt? LeAnn: Before JW and I married we knew we wanted kids and even mentioned the word “adoption” long before we ever faced any of the trials we have gone through. After the first 4 babies went to Heaven we started to pray and literally got one word “adopt.” So we started the process in October 2008 through an adoption agency, we were chosen December 2008 and Wacey was born March 2009! I never one time doubted if this was the path we were to choose. At the time I had been studying the book of Esther so she was a guiding light for me in the midst of some dark times! We stayed in Michigan with Wacey for a month and the trials that we endured came one after the other. The following year we were told about a little girl who was placed in a foster home 3 hours from us. We started to pursue her and two years later we finalized our adoption of Makayla. Through this time lots of messes popped up that we were not planning on. Fostering was not our intentions we were on a mission to adopt Makayla. Although, the state had different plans. This is what led us to being Foster Parents! We are considered a emergency placement now because of our busy schedules, but we take advantage of whatever opportunity is placed at our door step. I encourage anyone who is considering adoption to pray first and if you know this is your path then get embedded in the Word of God for encouragement. Surround yourself with people who are for you and above all things, trust God! No matter the circumstance HE is for you and your story is His story to write. Every mess has a purpose.. Cooped Up Cowboy's Wife: Tell us about Wacey & Mac, are they a lot alike or pretty different from each other? Cooped Up Cowboy's Wife: Any good ranch wife stories? LeAnn: Its a rarity to have JW hear me when I present an idea that may help our day go a little smoother! Not long ago we started planning a day to get cattle worked and branded. Our cattle can be a little hard headed much like our marriage used to be, LOL! So we were talking about “how” we planned to gather our crazy Mommas. JW’s plan was like every time before, push them through a gate to the south pasture, close that gate, get thedogs on them, get around them horseback and start pushing towards the pens. I had a thought and for once didn’t hesitate to share! I said, “Why not take the wing we already have and connect panels from the wing fence to the fence a little west of the gate they are going through? That way when they go through the gate they are already in a trap. We shut the gate behind us and BAM all we have to do is push them to the pens…” His response, “They will never fall for that!” Well ,I guess he got to the thinking and without telling me that morning we headed to the pasture to gather the cattle and I noticed he had connected the wing fence to the other fence! I didn’t say anything, I just started praying, I surely didn’t wanna be wrong now that he used my idea! As we got through the gate the boys sat watching the dogs bay the cows and I took off making a big loop to get to the back side. As I got to my point I started praying for God to give these cows eyes to see that gate and started thanking the Lord for doing so. Then I started singing “Our God” LOL! I kid you not, a few minutes later they started trotting to the gate and WOOOOWEEEE they all went in! We got them trapped, pushed and lotted in 15 minutes!!! One of the hands said, “Man those are some good dogs right there.” I said, “No, that was all Jesus!” JW just grinned I believe he was waiting for me to have some smarty comment but I was on cloud nine! Cooped Up Cowboy's Wife: Can you give us some cowboy's wife wisdom? LeAnn: No matter the circumstance there is always an opportunity to be effective for the Kingdom! Messes are going to come and when they do ask God to change your perspective. In order to feel freedom from your mess you will have to face it. God will give you the confidence, strength, boldness and the extra push you need to do so. As my Great Grand Mother always said, “You don’t get in the swamp to swim with the alligators, you get in to drain the swamp!” Keep Moving! Don’t label God to certain areas of your life, when you label God you limit God. It's hard to keep moving when you have given the Lord limited access to your life. It's important to understand that often the best “Yes” is sometimes “NO!” I was consumed for so long because I hadn’t given the Lord access to being number 1 in my life. Finally, when I asked him to take over, He did. I still don’t understand the “why” behind every mess but I “trust” His purpose for every reason. It's his message to share, not mine… I’m just a vessel, just a servant being used for a plan that is way bigger than me! Scripture references: James 1:2, 1 Corinthians 10:3-6, Philippians 4:6, Matthew 6:14,15, Philippians 3:12-14, 1 Corinthians 1:25. Cooped Up Cowboy's Wife: What would you like to share with a woman who might be struggling with her marriage, kids or in her faith? Make sure to check out LeAnn's Facebook page if you're interested in keeping up with her devotionals.